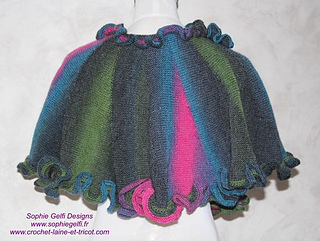 A circle shawl made with short rows and a fancy crocheted edge. Easy to knit and crochet, a beginner can do it. Easy to wear also and to customise. 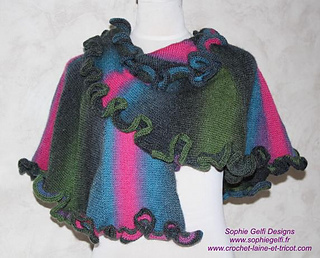 I made a second shawl with the same pattern and embellished it with freeform crochet scrumbles. 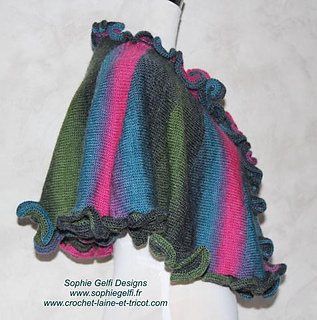 If you don’t know how to do freeform crochet, 4 tutorials are available in my ravelry store. The first 1 is available in american and french. Don’t hesitate to ask if you have any question and have a look at my other pattern in my ravelry store or in my website. Ce modèle est facile à faire et à porter. 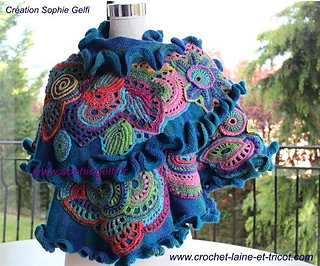 Si vous savez faire du jersey aux aiguilles et des brides au crochet, vous pouvez le faire même si vous êtes débutante.